Dr. Thomas Farley, Philadelphia Health Commissioner, speaks during a press conference at the Health Center 10, 2230 Cottman Ave. In a city known for its world-class hospitals and cutting-edge medical treatments, some Philadelphia residents have limited access to even the most basic of care, the Philadelphia Department of Public Health said Tuesday. 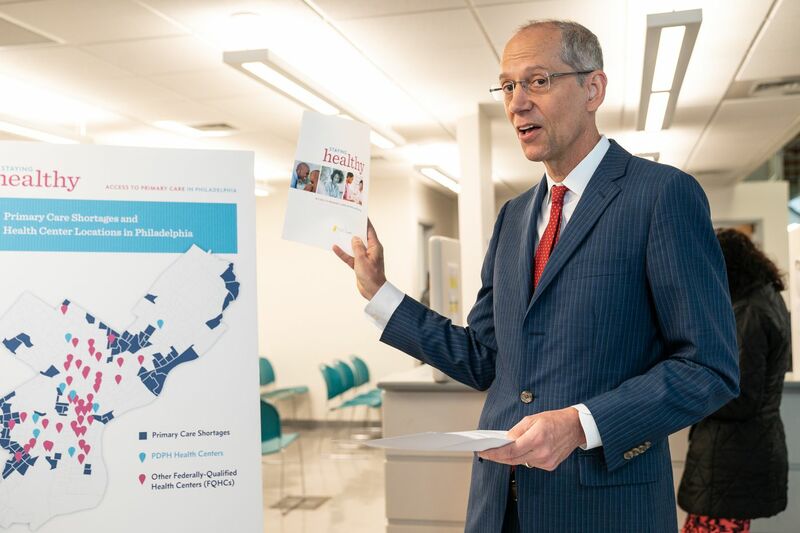 "Until now, we haven't had a comprehensive view of primary care across Philadelphia," Health Commissioner Thomas Farley said at a news conference. The city's report, developed in conjunction with the Leonard Davis Institute of Health Economics at the University of Pennsylvania, mapped out the neighborhoods that have residents with health insurance, a high number of primary-care providers, and community health-care centers or hospitals, as well as those neighborhoods that don't. Though some parts of the city have a primary-care provider for every 1,243 residents, a ratio on par with the national average, residents in the Far Northeast and Southwest have just one provider for every 3,500 residents — a ratio that is federally defined as a shortage area. "Primary care is the most important and most underrecognized part of our health system," Farley said. At a primary health-care clinic, doctors and nurses help patients manage such conditions as diabetes and high-blood pressure and prevent costly visits to emergency departments or hospitalizations, he said. "Primary care is where health systems save lives," Farley said. "Philadelphia needs more of it." Philadelphia has one primary-care provider for every 1,243 residents, a ratio similar to the national average. But the low availability of primary-care physicians in several parts of the city meets the federal definition of a shortage area. One positive finding from the report is that the Affordable Care Act and Medicaid expansion are working, said Raynard Washington, chief epidemiologist of the health department. Philadelphia's uninsured rates have decreased, he said, from 20 percent of the city's population in 2013 to just under 12 percent in 2016. The report suggested three solutions. Health systems and federally qualified health-care centers should expand where the need is greatest; health-care systems and managed-care organizations should ensure adequate access for Medicaid patients; and primary-care providers should improve management of chronic conditions so that fewer patients have avoidable hospitalizations, Farley said. "We think nonprofit hospitals have an obligation to look at those areas where people are most vulnerable and have the most need," he said. Farley said the next step would be for the department to develop another health-care center in the Northeast. The city has funding set aside it hopes will be enough but is seeking more, he said. Even with the proposed health-care center, Northeast residents still wouldn't have adequate access to primary care, he said. The news conference was held at Health Center 10 on Cottman Avenue in the Castor section of the Northeast. The center, operated by the health department, is the busiest and most overcrowded of the city's eight health clinics. Collectively, the clinics provide care to about 80,000 residents — 5 percent of the city's population — a year. Patients seek care at Health Center 10, located at 2230 Cottman Ave., in Northeast Philadelphia. "This is supposed to be their slow time, and it is nothing but busy," said City Councilman Bobby Henon as lines of patients waited to check in at 9 a.m. Tuesday. Currently, there is a six-month wait for a doctor's appointment, said Joan Bland, the clinic's director and a nurse. For a walk-in, there is at least a half-hour wait to see a health-care provider, she said. The clinic is adding patient exam rooms in the basement, and has hired more nurse-practitioners to help with the patient load. The clinic is in an area rich with diversity. There are 12 interpreters on staff for patients who speak Chinese, Spanish, Russian, Hindi, and Urdu, among other languages. Six staff members, who all speak at least two languages, help patients set up insurance, Bland said. Carol Rogers, executive director of HealthyPhiladelphia, said the solution must come from more than just the city and that health-care organizations and hospitals need to expand their care to people regardless of insurance status. "Thousands of Philadelphians are unable to get the health care we all need to stay healthy and to live to our full potential — and that we all deserve," she said.